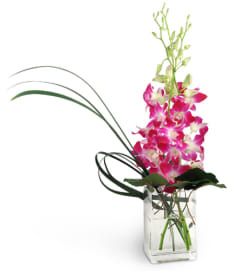 Classic pink orchids pair seamlessly with the chic look of a succulent "bloom" in this unique and modern floral vase that makes a perfect gift for any occasion. 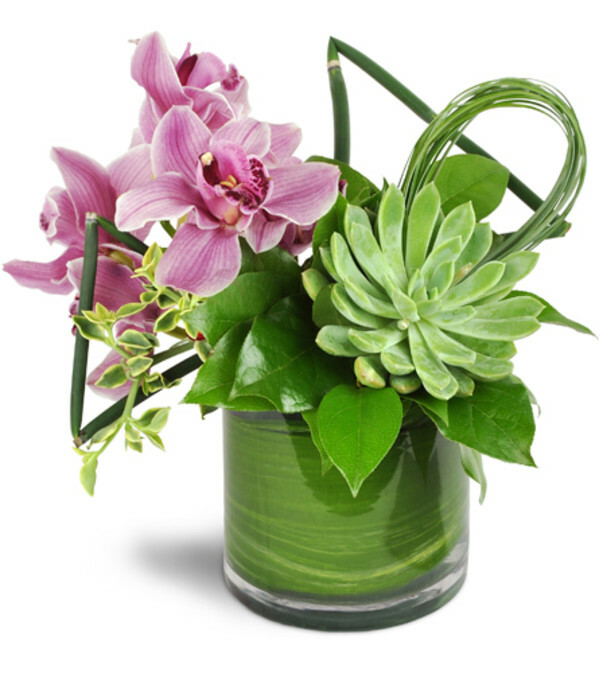 Birthdays, a special "I love you" sentiment, or a corporate gift are all perfect reasons to give this versatile, tastefully memorable bouquet. 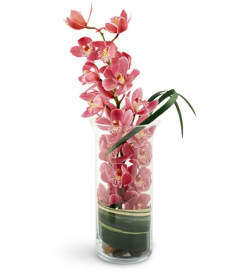 Pink cymbidium orchids are the backdrop for a large succulent centerpiece plant, arranged in a clear, wide-mouthed leaf lined clear glass vase. Decorative green grass and reed triangle sculptural accents add visual interest to this stunning bouquet. 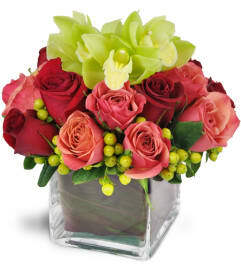 Beautifu flowers with amazing customer service! Couldn't believe they were able to get my flowers out same day without crazy last-minute fees. Will use for all my future business/personal needs! Grace and Angie were like Fairy Godmothers who made this bride’s wedding complete with fresh, beautiful flowers for her special day.They exceeded expectations.Found them via yelp/google so didn’t know what to expect with literally my last minute order. They came through with a phone chat and text order confirming details and reference photos - the night before my wedding!I requested boho style bride’s bouquet, jr. bridesmaid bouquet, groom’s boutonnière and maid of honor’s corsage. Not only did they have it ready on time - before ceremony, but they were beautiful. The flowers not only looked beautiful but had a beautiful fragrance and lasted days after our wedding! The ribbon quality wasn’t my fave but you couldn’t really tell in the photos and it was constructed so well - all (4) pieces withstood an active day of transport and photo shoot poses and locations.We are now loyalists. We will be buying flowers from them, again. Highly recommend Bell Tower Florist - they can be trusted with your most special celebrations. 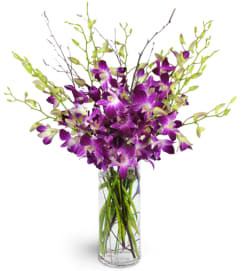 Bell Tower Florist & Gifts is a Lovingly Florist in Lake Forest. Buying local matters. Discover how Lovingly supports local florists. Copyrighted images herein are used with permission by Bell Tower Florist & Gifts.